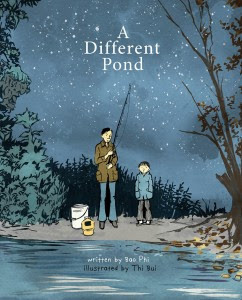 A Different Pond is a young boy's survival story of a fishing trip with his father, told in the Social Realist spirit of Eve Bunting's Fly Away Home. Father and son are up before sunrise. A successful morning means dinner for the boy's large Vietnamese-American family. The boy asks, "If you got another job, why do we still have to fish for food?" His father explains, "Everything in America costs a lot of money." True to life, important conversation happens while performing routine tasks. Waiting for a fish to bite, the father talks about a pond in Vietnam, where he fished when he was young. "With your brother?" asks the son. The father nods and looks away. The silence is understood. The boy knows that his father's brother "didn't come home" from the war. But the next scene is more upbeat with a fish on the line, and the boy guides more into his bucket. "I am not a baby…I helped catch dinner," he will think later at home. Located off a city highway, the pond looks serene in the early morning hours, with trees in shades of blue and green, or solid black against a starry sky. Thi Bui’s graphic novel panels sync perfectly with the somber beauty of the book. A Different Pond is about hardship, told with understated affection, and in a matter-of-fact way that speaks to the strength of its characters. Pitch perfect and true. Read about author and poet, Bao Phi here.